Singh, Abhinav / Purohit, Bharathi M.
Purpose: To determine the efficacy of high-fluoride toothpastes (≥ 2500 ppm) as compared to standard fluoride toothpastes (≤ 1500 ppm) in preventing dental caries. Materials and Methods: Randomised controlled trials (RCTs) and cluster-randomised trials comparing high-fluoride dentifrices (≥ 2500 ppm) with lower-concentration fluoride dentifrices (≤ 1500 ppm) with a follow-up period of at least 6 months were included. A random effects model was used to assess the mean differences in caries increment between the two types of dentifrices used. A fixed effects model was used to determine the preventive effect of high-concentration fluoride toothpastes compared with low-fluoride toothpastes. Subgroup and sensitivity analyses were conducted when results indicated heterogeneity. Statistical significance was set at p < 0.05. Results: Eight studies met the inclusion criteria. High-fluoride toothpaste use was statistically significantly associated with lower caries increment scores (pooled mean difference: -0.52 [95% CI, -0.67, -0.37], p = 0.00001). Subgroup analysis for the included studies reflected a significant reduction in I2 values from 99% to 18%. High-fluoride toothpastes were also associated with a greater preventive effect compared with low-fluoride toothpastes (pooled odds: 52.76 [95% CI, 19.74, 141.04], p = 0.95). Conclusion: This meta-analysis suggests that high-fluoride toothpastes are superior to low-fluoride toothpastes in reducing caries. The results of this work when used judiciously should encourage the use of high-fluoride toothpaste, specifically among the vulnerable populations, to maximise preventive benefits. Purpose: To investigate the short- and long-term effects of different combinations of dietary instructions on cariogenic food intake and salivary cariogenic bacteria (Streptococcus mutans [SM] and Lactobacillus [LB]). Materials and Methods: In this randomised 2-arm parallel study, 75 6-year-old subjects were assigned to repeated (group A; 19M/19F) or isolated (group B; 17M/20F) verbal and/or written dietary advice (VWDA), with foods classified by cariogenic potential. Both groups underwent a baseline salivary test for SM/LB, kept a monthly food diary, and attended 4 weekly visits (T1-T4). At T1-T2; group A only received VDA. At T3, both groups received VWDA. At T4, participants handed in their food diaries and underwent another salivary test. After 1 year (T5), subjects were recalled for weekly food diary monitoring and salivary testing. Relative risk (RR) of high-to-low SM/LB density was calculated at T4 and T5. Results: Comparing groups A and B, VDA determined an increase in the intake of weakly cariogenic food (p < 0.05) and a decrease in that of intermediately cariogenic food (p < 0.05). After VWDA, a statistically significant increase in intake of weakly cariogenic food and a statistically significant decrease in the RR of high-density SM/LB colonies occurred in both groups. At T5, group A showed less intake of highly cariogenic food than did group B (p = 0.05) and persistent, although non-significant, reduction in the RR of high-density SM/LB colonies. Conclusions: Reinforcement measures on behavioural changes towards a noncariogenic diet not only help maintain long-lasting, healthier eating habits, but also decrease the cariogenic bacterial load in the short term, which tends to persist over time. Purpose: To investigate changes in periodontal parameters and superoxide dismutase activity after root surface debridement with and without omega-3 fatty acid (omega-3 FA) supplementation in postmenopausal women. Materials and Methods: Fifty postmenopausal women with chronic periodontitis were divided randomly into two groups. Group 1 (control group, n = 25) patients were provided with periodontal treatment in the form of scaling and root planing (SRP) plus soft gelatinous capsules containing only some olive oil, while group 2 (n = 25) received SRP along with systemic administration of omega-3 FAs in the same soft gelatinous capsules. Clinical parameters and superoxide dismutase (SOD) activity in the gingival crevicular fluid were recorded at baseline, 3 and 6 months after therapy. Results: By the end of the study period, the omega-3-treated group achieved a greater mean probing pocket depth reduction, a mean gain in clinical attachment level especially in deep periodontal pockets, as well as a greater increase in SOD activity (p < 0.01) compared to SRP alone. Conclusions: Adjunctive omega-3 FAs supplements with SRP reduce periodontal inflammation and improve the status of systemic enzymatic antioxidants in postmenopausal women. Parish, Carrigan L. / Santella, Anthony J. Purpose: Lesbian, Gay, Bisexual, Transgender, and Queer (LGBTQ) cultural competency and awareness in healthcare settings have been recognized for minimizing health disparities, yet their integration within the oral health community has been minimal. Furthermore, despite evidence showing the compatibility of rapid HIV testing (RHT) in the oral health setting, actual uptake by dentists has been limited. The purpose of this qualitative study was to document New York State dental directors' perspectives and attitudes regarding issues relevant to the LGBTQ patient care and RHT. Materials and Methods: Semi-structured interviews (N=10) were conducted with New York State dental directors practicing in areas of high HIV prevalence. A deductive and inductive qualitative approach was used to develop an interview guide, in accordance with the Theory of Planned Behavior, that elicited their perspectives, attitudes, and perspectives on RHT and LGBTQ issues. Results: Thematic analysis of the interviews revealed that many dentists cited limited, if any, training and experience in RHT and LGBTQ patient care. Additionally, there was also an evident dichotomy between dentists who were offering RHT and dentists who were knowledgeable and well-versed in LGBTQ issues. Barriers to implementation included time constraints and minimal training and knowledge. 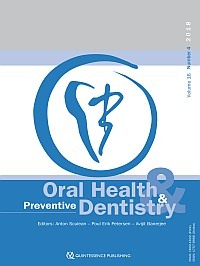 Conclusions: While potential facilitators such as test kit reimbursement and patient referral sources could enable LGBTQ and RHT training and uptake, actual implementation in the oral health setting will likely require additional trainings, more involved collaboration with primary care providers, and an overall cultural change amongst the dental profession. Purpose: To evaluate the efficacy of Clinpro XT in reducing dentin permeability and the stability of this effect after different acid challenges. Materials and Methods: Sixty-five roots of extracted human third molars were used. From each tooth, one dentin specimen was prepared and connected to a fluid filtration system to measure the dentin permeability after each of the following steps: sample preparation; treatment with 37% phosphoric acid; application of Clinpro XT; three acid challenges. Specimens were randomly assigned to 5 groups (n = 13) according to the acidic solution applied: Coca-Cola, natural lemon juice, wine vinegar, white wine and Red Bull energy drink. An additional 10 third molars were used to evaluate the degree of occlusion of the dentinal tubules and the surface roughness. Results: Clinpro XT statistically significantly reduced dentin permeability after just a single application. No statistically significant increase in dentin permeability could be detected after three consecutive challenges. The application of Clinpro XT promotes the occlusion of dentinal tubules and reduces the surface roughness. Conclusion: The Clinpro XT is effective in reducing dentin permeability. This effect persists even after acid challenges. Purpose: To evaluate the effectiveness of Vanish XT in preventing white spot lesions (WSLs) when placed around orthodontic brackets. The efficacy of Vanish XT was compared with that of Pro Seal, a commercially available product already proven in preventing demineralization. Materials and Methods: Sixty extracted human canine teeth were divided into three groups (n = 20). The two experimental groups were treated with either Vanish XT or Pro Seal. A third group received no treatment (control). Ethidium bromide with DNA was added to and mixed with the products to produce fluorescence to verify retention of the experimental products. The teeth were submersed in a lactic acid solution for 32 days to create WSLs. All sample teeth were brushed twice daily with a non-fluoride toothpaste to evaluate retention of the experimental products. Photos were taken under fluorescence microscopy and white light at three time intervals. Demineralization was quantified utilizing computer software, and photos were analyzed to obtain values for percent surface area of demineralization and surface color change. Results: Percent surface area of WSL data, both under white light conditions and fluorometric analysis, revealed a significant difference between Pro Seal and Vanish XT when compared with the control group. No significant differences were found between Pro Seal and Vanish XT treated teeth. Fluorescence evaluation revealed that both experimental products were largely removed by 32 days of brushing and acid exposure. Conclusion: Vanish XT is effective in preventing demineralization around orthodontic brackets. Its preventive efficacy is equivalent to that of Pro Seal. Purpose: To assess urinary fluoride excretion after topical application of a commercial fluoride varnish in preschool children. Materials and Methods: Twelve healthy children, 2.5-6.0 years of age, were enrolled in a placebo-controlled cross-over trial. After a 5-day run-in period, the morning urine was collected as baseline. One hour after breakfast, 0.1 ml of the active (Fluor Protector S; 7,700 ppm F) or the placebo varnish was applied with a microbrush on the buccal surfaces of the primary teeth. Thereafter, a 6-h urine sample was collected and the fluoride content was determined with an ion-sensitive electrode. The parents supervised toothbrushing with a small-fingernail amount of fluoride toothpaste (1000 ppm) twice daily during the entire experiment. Results: One boy failed to comply with the urinary samplings and was excluded. The mean fluoride concentration in the 6-h urine samples was slightly higher after the active varnish compared with the placebo varnish, but the difference was not statistically significant. Likewise, no statistically significant differences were obtained when the post-treatment concentrations were compared with baseline for the two varnishes. No side-effects or adverse events were reported. Conclusion: A single topical treatment with the investigated varnish did not significantly increase the urinary fluoride excretion compared with placebo in preschool children with parallel use of fluoride toothpaste. Purpose: To evaluate the effects of Wi-Fi and lactic acid bacteria on salivary mutans streptococci and caries formation. Materials and Methods: Wistar rats and their offspring were equally divided into two main groups and seven subgroups. Experimental groups were exposed to Wi-Fi during pregnancy and lactation. Subgroups were divided according the administration of the beneficial bacteria L. plantarum 167.P6.5 and L. rhamnosus M17-10.2. In the 8-week experimental period after weaning at 21 days, Mutans streptococci counts and the number of carious lesions were determined. Results: The MS count ratios at the end of 8 weeks were statistically significantly lower than those at the end of 4 weeks in all groups given L. rhamnosus (p < 0.05). A strong correlation was found between the total MS count and sulcal caries scores (r = 0.507). No statistically significant difference was observed between groups exposed to Wi-Fi and other groups in terms of microorganism count and caries scores (p < 0.05). Conclusions: These results suggest that lactic acid bacteria, especially those originating from an oral source, may be of benefit as probiotics for the prevention of oral pathogens and dental caries. Perinatal and lactational exposure to Wi-Fi does not predispose to caries development in rats. Purpose: To evaluate caries among nursery-school children. Materials and Methods: Clinical examination was carried out in 1123 children (568 girls and 555 boys), aged 6-47 months, who attended 33 nursery schools located in a large city (Poznan, Poland). The research was done by experienced dentists in accordance with the criteria set by the World Health Organization for epidemiological studies. The obtained data determined the frequency of caries and the number and surfaces of teeth with carious lesions. In Poznan, drinking water is not artificially fluoridated. Results: The prevalence of caries in the general population was 7.21%. The mean number of teeth affected by caries in the whole population was 0.26 (0.24 for girls and 0.28 for boys), whereas the mean number of tooth surfaces affected by caries was 0.37 (0.32 and 0.41, respectively). In the maxilla, most of the carious lesions were located in the incisors; in contrast, in the mandible, they were in the molars. Only 3 of the examined children had prior fillings. Conclusions: Currently, preventive and curative dental care for nursery-school-age children is unsatisfactory. The results obtained indicate the need for monitoring the oral health of young children. Purpose: To characterise in vivo the structure of bacterial communities in decayed and sound primary teeth. Materials and Methods: Samples of biofilms were collected from three groups of patients with complete and exclusively primary dentition (n = 45): G1: sound teeth (n = 15); G2: enamel lesion (n = 15); G3: dentin lesion (n = 15). DNA was extracted (CTAB 2%) from the biofilm, the partial 16S rRNA gene was amplified with Bacteria Universal Primers (BA338fGC - UN518r) and subjected to DGGE (denaturing gradient gel electrophoresis). Multidimensional scaling and ANOSIM (analysis of similarity) were employed to determine the structure of the bacterial communities. The amplicon richness was determined by averaging amplicons, with the differences between treatments determined with ANOVA, while means were compared using Tukey's test (p < 0.05). Results: Compared to sound teeth, a greater variety of bacterial communities was found in decayed teeth. Despite the differences between the bacterial communities of sound teeth and decayed teeth, the Venn diagram showed that the samples had 38 amplicons in common. Greater amplicon richness was observed in samples of decayed teeth (enamel: 20.5 ± 2.7; dentin: 20.1 ± 2.8) compared with the sound samples (12.0 ± 4.3) (p <0.05), indicating enhanced growth for specific groups of bacteria on decayed teeth. Conclusion: Although there is less bacterial diversity on sound than ECC-decayed teeth, the bacterial communities are very similar. Purpose: This study aimed to assess the impact of using magnifying loupes on interexaminer agreement in the detection of noncavitated occlusal carious lesions. Materials and Methods: A total of 155 permanent molars with no frank cavitation were selected for the study. Five examiners with different specialties and experience each examined the occlusal surfaces twice using International Caries Assessment and Detection System (ICDAS) criteria. The first examination used no magnification. The second examination, performed 4 weeks after the first, used 2.5X magnifying loupes. Later, the teeth were sectioned and inspected for caries using a stereomicroscope. The data were analysed using statistical analysis software to calculate intra-examiner reproducibility and interexaminer agreement as well as univariate marginal distribution and marginal homogeneity maximum Kappa (Kmax) statistics with and without the loupes. Results: The Kmax scores for 4 of the 5 examiners showed bias compared to the histological results, with a greater likelihood of diagnosing a tooth as sound in the presence of caries (Kmax 0.26-0.73 and 0.19-0.65 with and without the loupes, respectively). For intra-examiner reproducibility, the linear weighted kappa ranged from (0.34-0.65) . Interexaminer agreement was poor both with and without the loupes. Conclusions: The use of magnifying loupes did not improve interexaminer agreement in ICDAS scores for noncavitated occlusal carious lesions.